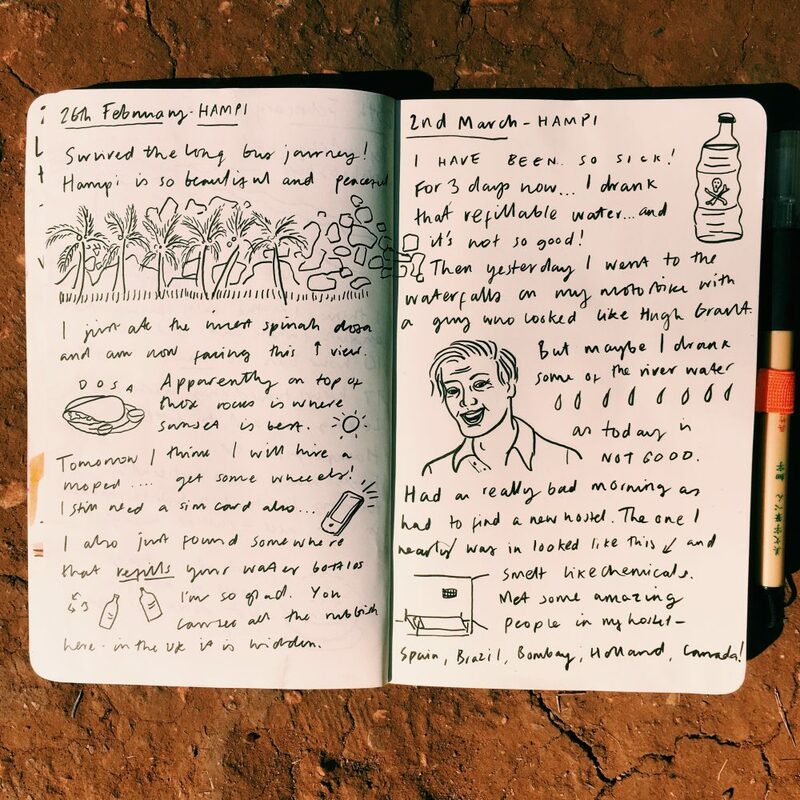 Stories from an illustrated travel : Happy Hampi! 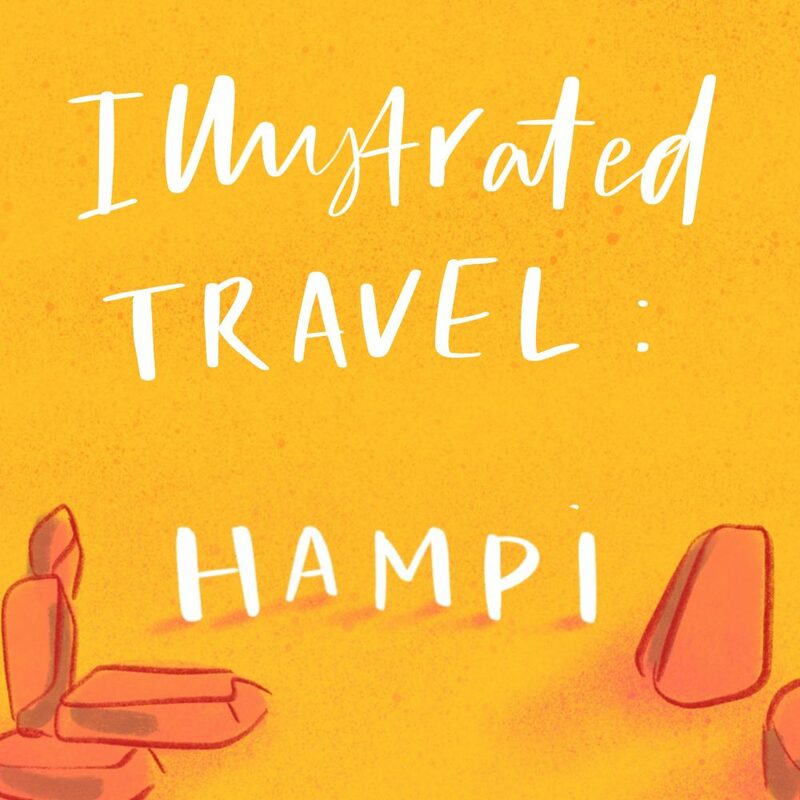 I had heard amazing things about Hampi and its amazing natural landscape, ancient temple ruins and laid back hippy vibe and definitely felt like this was somewhere I wanted to spend some time to explore, chill, and do some of my illustrated travel drawings. 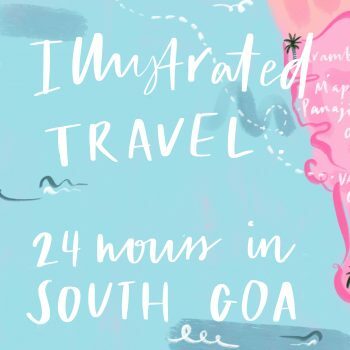 I headed here by bus after spending some time in Goa, read about my time accompanied by travel illustrations in Goa here. Now, Hampi has recently been credited with its super special UNESCO world heritage site title. This means it has quite strict restrictions on what it can and can’t build near its ancient temple ruins, and its main bazaar has had to shut down. There are though still some hostels in the main attraction area of Hampi, though I’d advise staying over the water, a beautiful 2 minute ferry ride away, nicknamed ‘Hippy Island’ where I found beautiful paddy fields, the best sunset point over Hampi, and lots of other backpackers to make friends with! 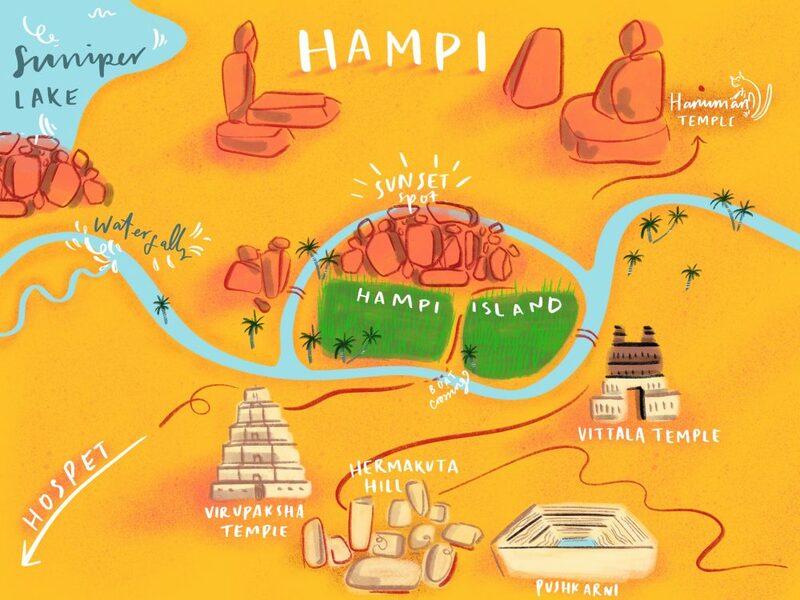 Illustrated travel map of Hampi, India by Jasmine Hortop. Showing where to find the sunset point, Hampi Island, and the main sights to see in Hampi! One of the first things I do whenever I get to a new town or city, is to get myself some transport baby! Whether it’s a moped, bicycle, or electric scooter like we did in Madrid – it’s my favourite way to explore a place. Getting lost, finding amazing little hidden gems on the way, and working your way back home again. In Hampi I got my moped for only 100 rupees a day (£1.10! ), TOOT! Just make sure to be careful, as accidents DO HAPPEN! I managed to fall off my bike with my friend while not even moving (we were attempting to carry way too much stuff to actually get moving). Less big, high majestic waterfalls and more tumbling water over rocks with rapids at the bottom. This is great to swim in, but be careful of the current! Also – be careful not to swallow the water… I jumped in when I was just getting better.. and next thing you know – I’m sick again! Now this is a really beautiful spot! You can sit on the side, have a swim, or go for a boat ride in one of the round coracle circular boats. I chose not to go for a swim here as there were quite a few locals around and I didn’t feel it as appropriate to be in my bikini, where as the waterfalls it was quiet and I did. Hampi has the most amazing landscape – I kept thinking they could have filmed the Flintstones there. There are bouldering courses on offer but with being sick, I never would have had the strength for this, so just stuck to my own clambering and jumping, which is fun in itself! You can climb to the top of all the rocks for the most amazing sunset view over Hampi. Get a chai at the top, enjoy the chill-hop music someone will no doubtedly be playing through some speakers, and feast your eyes on crazy scenery below. The monkeys like to watch the sunset from up there too! 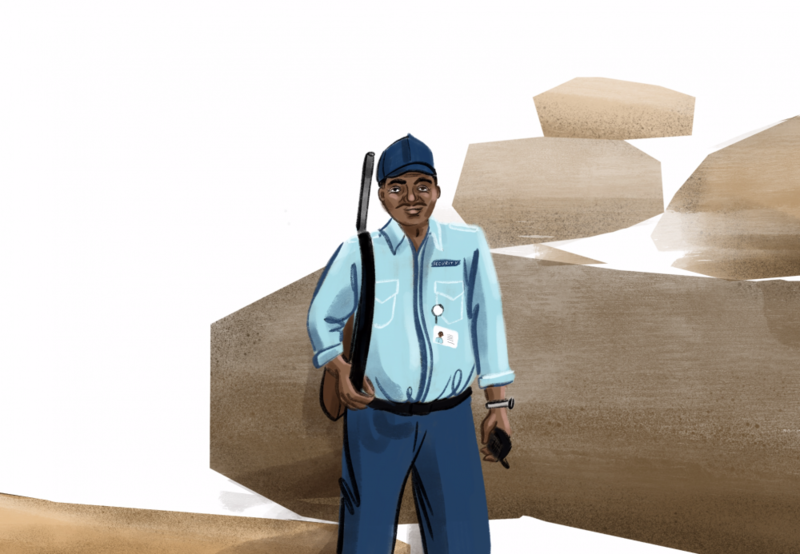 Super happy security man guarding the ancient ruins in Hampi! 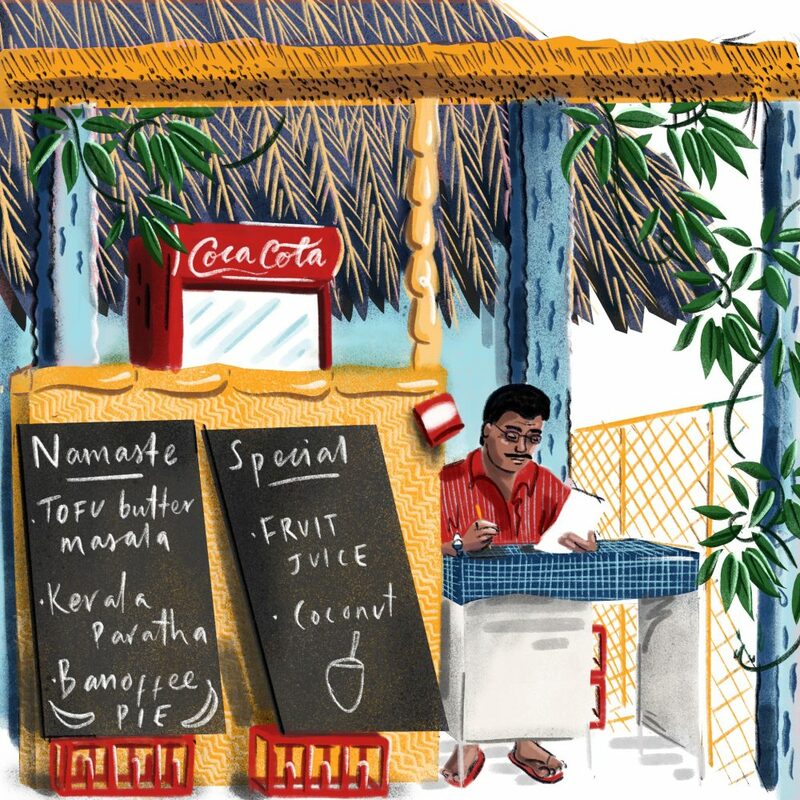 Illustrated travel Hampi – What sights not to miss! 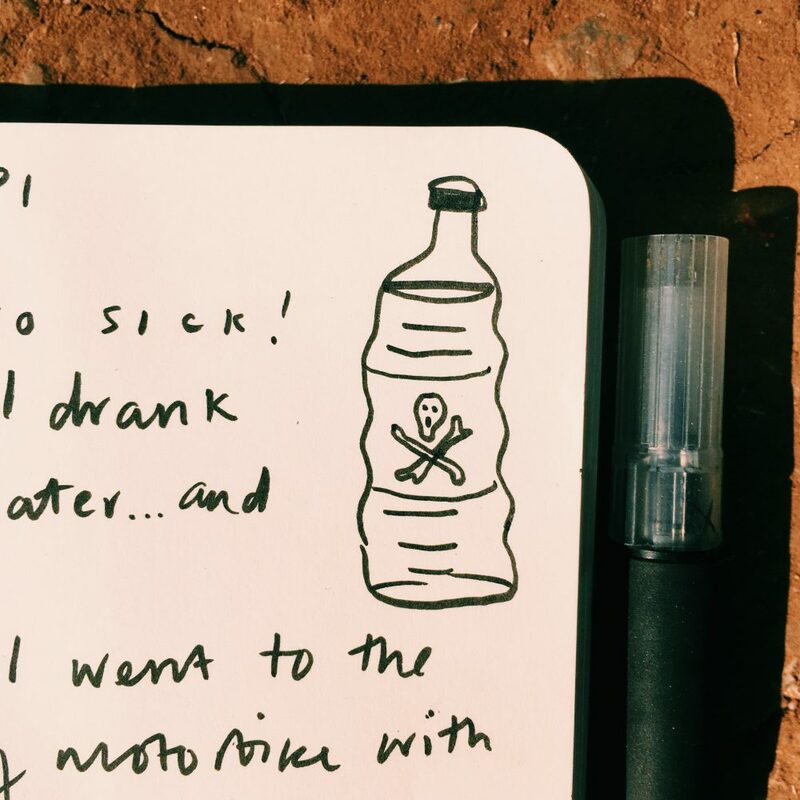 Other things you have to do in Hampi if you’re not stuck in a sick bed! I went to the main one – Virupaksha Temple. It has loads of amazing sculptures and paintings on the ceilings. But it also has an elephant which is kept inside, it’s supposed to be holy, and people give money to be blessed by it. I found this really sad to see, and wish it was not in there! Go watch the sunset from Monkey Temple (Hanuman Temple)! This is a little ride away and I always wanted to go, but alas, I was too ill. Unfortunately for me – the day after getting my moped I got super sick. I won’t go into details, but it wasn’t great, especially when you’re on your own! Luckily the hostel I was staying in were great, and checked on me a lot. I am pretty sure I got sick by being an eco-martyr, I was getting stressed about the amount of single use plastic I was using, and refilled my 2l bottle with filtered water. This water is usually fine for locals, and I probably would have been fine if I had built up to it, but 2 litres in one go ain’t the one. This was completely my own dumb mistake, I should have been more prepared and invested in a water filter bottle like this Life Straw one, which I will definitely be getting one for my next trip. Double page from my visual journal – with a few days missing in between when I sick sick sick! The water that haunts me still..
My time in Hampi was a weird one, I was sick for a total of 5 days out of 7, and was pretty much bed bound for 2 of those. Nether-less I really enjoyed it, I spent more time in my hostel, which was set a way back from the main little stretch on Hippy Island, was really quiet, had a community vibe and a chilled social area (this always had people in to chat to, mainly because everyone there was getting a smoke on!). So this silver lining was that I met loads of really interesting people here, and even another artist, who was also travelling with an iPad Pro! We compared Procreate tips, and I even ended up leaving a sketchbook with her when I moved on that I wasn’t enjoying drawing in. I love exploring a place, and having time to myself to draw, but if it hasn’t happened naturally, I always make sure to check in to somewhere social every so often (you can check reviews for things like this one Trip Advisor, or backpacking groups on Facebook), as it’s also the interesting people and you meet and connections you make while solo travelling I enjoy so much. 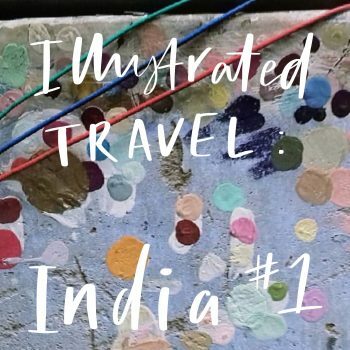 Stories from an illustrated travel : India – The first time round!